Venture Axis were responsible for creating the web service and so Atom Engine was brought on board to complete the iOS application development element of the project. For a brand with a global presence such as HERSHEYS, it can be difficult to maintain the look of your brand in different locations. The app was developed to enable teams in the field to monitor and maintain their global brand presence. 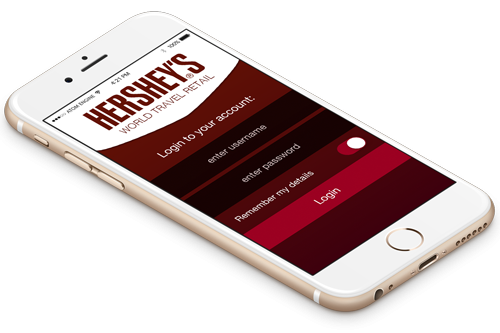 The app allowed Hersheys’ employees to send in photographs from all around the world to a centralised storage base, allowing for all Hershey’s Point of Sale stands to be maintained in a standardised way across global retail outlets keeping the brand consistent. Some of the locations in which the app is required to work can be quite remote. We ensured it works by storing a queue of images stored locally on the device and then uploaded when the user has a sufficiently strong internet connection. This allows the app to be continually used, regardless of its location. With consistent branding and an uncomplicated UI design, the app is accessible to any employees at any level of the organisation. If you’re looking for innovative ways to streamline your business operations we can help. Contact us today to discuss your requirements.